In the last year Council have sought views from existing allotment holders in relation to new rules for operating allotments and the pricing per plot. Council resolved to implement an amended set of rules to reflect the feedback received in the survey and also to hold prices for the time being. New allotment agreements will be issued in the last quarter of 2016 as part of the annual renewal process. Also from the survey we received quite a few suggestions for improvements which will be logged and reviewed by the amenities committee in 2017. If you would like to see the feedback we have had so far from those who have shared their views - just have a look at the survey results. There is now a small waiting list which by the start of 2017 should have allotments allocated to them across both sites as a result of the giving up of allotments around September and October. The Town Council run two allotment sites in Uppingham. There are 17 plots situated off Tod's Piece and Tod's Terrace – these were the first allotment plots offered by the Council. This site was supplemented by a larger and more spacious site off Leicester Road. Leicester Road currently has over 70 plots the majority of which are occupied and in use. 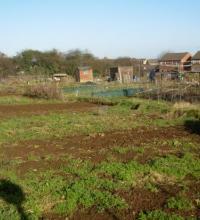 If you are interested in renting an allotment the current charge for a full plot is £25.00 per annum. There isn't an allotment holders association in operation at either site and renewals for the annual rent take place in September each year. There is a short waiting list and you can add your name to it by completing this short submission form below. If you have any questions just call the Town Hall or email. XHTML 1.0 validated. WCAG compliant. Page generated in 0.0878 seconds.